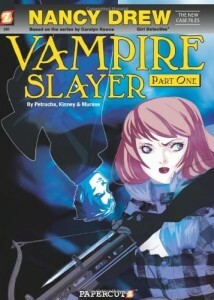 You might wonder why I read a couple of Nancy Drew graphic novels, but when I tell you that these volumes comprise parts one and two of an arc called “Vampire Slayer,” perhaps you will understand. It was the unlikely union of Nancy Drew and Buffy—and yes, said show is specifically referenced in the endnotes—that compelled me and my compatriots at Triple Take to make this our pick for this month. I admit I didn’t expect to like this very much, but the story turned out to be even more blah than I was anticipating. Here’s the premise: Nancy and friends Bess and George are on their way to see the hot new movie, Dielight. If they arrive in costume, they get a discount, so when they are chased by a pointy-toothed guy in the cemetery (is it supposed to be a fun twist when it’s revealed that he’s actually running from Nancy’s dog?) they assume he’s headed there, as well. He doesn’t show up for the film, but Nancy spots a mysterious-looking cloaked figure lurking alone in the back of the theatre. Nancy: Thanks… I’m flattered, but I already have a Ned… I mean… boyfriend. Ned: Hi. I’m boyfriend. I mean Ned. Anyway, things don’t improve very much from here. Gregor indicates that he has a secret, but he won’t divulge it until he is sure that he can trust Nancy. And because Nancy is a big nosypants, she ends up hanging out with him all the time, oblivious to Ned’s growing jealousy. At first I was pleased that Ned was confident that Nancy would not cheat on him, but that doesn’t last long and he soon begins throwing jealous hissy fits. Gregor’s secret turns out to be totally lame—someone’s stalking him because they think he’s a vampire—and so does the resolution of the story. Ultimately, the adjective that most comes to mind when describing this story is “lazy.” In addition to the fact that Gregor’s secret is a letdown and Ned’s reaction predictable, there are other signs of shoddy craftsmanship. Gregor claims not to have a cell phone, but then how is he receiving threatening text messages from his stalker? The big reveal (spoilers, if you care) that the stalker is actually Gregor’s long-lost sister Garina is torpedoed when Nancy refers to the girl as Garina several pages before the existence of Gregor’s twin even comes up. And I’d swear that one scene of Gregor and Nancy sitting at a table was simply copied and pasted from one place to another, with only a slight adjustment of Gregor’s arm and the application of some green tint to Nancy’s shirt to differentiate them. Probably they thought that only kids would read this and no one would notice, but kids deserve effort and originality, too. About the best thing I can say about this is that Nancy’s friend, George, is appealingly androgynous. She should get her own series. Oh yea.. there was never any reason given why he was sporting fangs in the first scene!!! I didn’t notice the Garina name thing though. I noticed when she called her that, testing her hunch. Did she actually do it before then? Also, dude is so rich, why doesn’t he hire a bodyguard or like.. actual security experts? Or, like.. I dunno.. a private detective? Guy is an idiot. I’ll stop now. There’s too many holes to poke in it. And I hate swiss cheese. Gregor mentioned where he lived somewhere near the beginning, so perhaps that clued them in to the fact that he’s rich. Yes, she used “Garina” in one of the voiceover narration boxes before Gregor even talked about his sister. Like, when beating her back was too easy on account of her sickliness. The Garina mention really bothered me a lot! I backtracked several pages, hoping to see where it was mentioned before, but no, it was just crappy writing combined with crappy editing. I was really disappointed by this. Like I said in my review, I had hoped that since they were starting over at 1 they really were completely rebooting the graphic novel series — to disassociate themselves with the terrible quality of the ones before. But no. These are exactly the same. The same writing team even. That should have tipped me off. Nah, Volume 3 was just released at the beginning of August, so there’s no indication yet that they’re stopping. Ah, okay. I’ve been seeing cover images for that for a while, but didn’t realize it wasn’t out yet. I only just discovered this while I was trying to track down if Hardy Boys #3 was a different book. Apple white - This book was amazing!I don’t know what you’re talking about. Copyright Triple Take. All Rights Reserved.